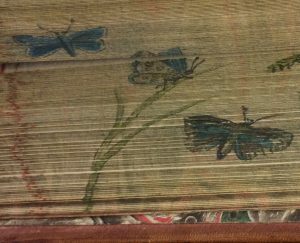 My first objective in researching the split fore-edge paintings with natural studies was to try to identify some of the plant and animal species they portray. This seemed to me the logical place to begin, as it could potentially lead to further insights about the books, or at least inform my understanding of the paintings’ subjects. 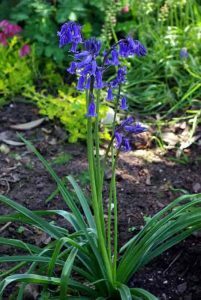 I began with the most easily identifiable plant on #111 – the distinctive bluebell, which I immediately recognized. Acting on a hunch, I searched the regions in which bluebells grow, and ascertained that they are most common on the British Isles. 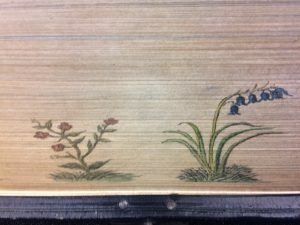 From there, I researched other common wildflowers native to Great Britain, and found several potential matches: one of the flowers on the verso painting of the book is almost certainly the common yarrow, while another bears a marked resemblance to the scarlet pimpernel and yet another can be identified as a primrose. As all of these flowers are native to the British Isles, I felt that it was safe to assume that this is a reliable common thread between all of the plants in this painting. Operating under the assumption that the stylistic similarities between the books indicates a common origin, I began my research into book #138 with insects of Great Britain, and I was instantly rewarded with several fairly definitive matches. I was able to safely identify two of the butterflies as a male common blue (left) and a female Adonis blue (right), and one (very distinctive) caterpillar as the puss moth caterpillar. 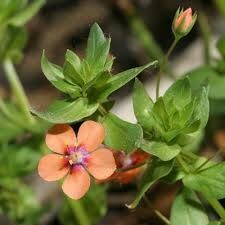 Others, I managed to less reliably identify. 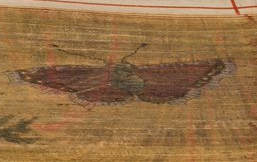 For instance, I hypothesized that one large butterfly on the verso painting is a peacock butterfly because of the color and shape of its wings, but it lacks the appropriate markings that would confirm this hypothesis. 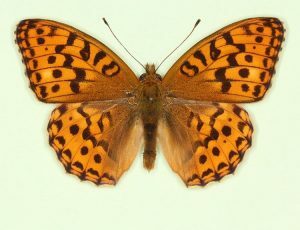 Another that posed problems was an orange butterfly on the recto painting which most closely resembles the high brown fritillary in coloration, but follows the patterning of the underside of the insect’s wings despite being viewed with its wings open. 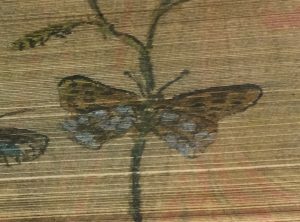 One possible explanation for this is that the insect in the painting is actually being viewed with its wings closed from its underside, which could account for the inclusion of the stalk on which it is resting, despite the fact that only one other butterfly is similarly landed. 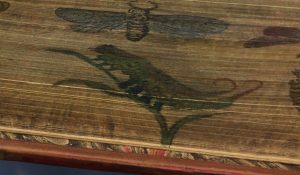 I also managed to successfully identify the bird on the verso painting of book #198 as a European green woodpecker, yet another species native to the British Isles. I was actually quite impressed by the accuracy of the painting to the species it depicts – the resemblance was instantly apparent. 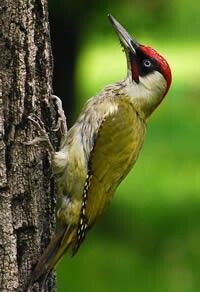 This identification also clarified a misconception I initially fostered about the painting: I originally read the painting as a depiction of a bird standing on a dirt ground, but the photographic images I found of the bird made it clear that it is actually clinging to the trunk of a tree. This resolves what I perceived to be conflicting orientations of the paintings, as I see now that both paintings are intended to be read vertically. 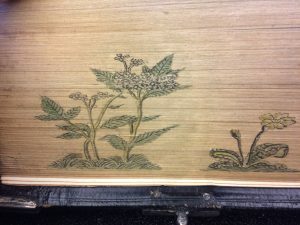 While I remain unable to identify several of the species included in these paintings, the fact that so many of the species are native to the same region that popularized fore-edge painting may suggest that all three of these books, despite their various origins and languages, were painted in Great Britain. I do, however, remain hesitant to settle on this conclusion, as many of these species are distributed across other parts of Europe, as well. Perhaps a more definitive answer lies in the identities of the species I have yet to place. Cheshire, Steven. 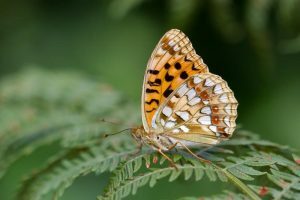 “Steven Cheshire’s British Butterflies.” 2000-2017. 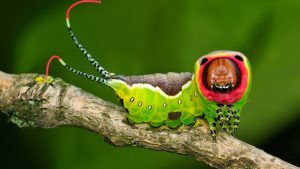 Accessed 15 October 2017. https://www.britishbutterflies.co.uk/index.asp. “Hyacinthoides Non-Scripta.” Wikipedia. 8 May 2017. Accessed 10 October 2017. https://en.wikipedia.org/wiki/Hyacinthoides_non-scripta. 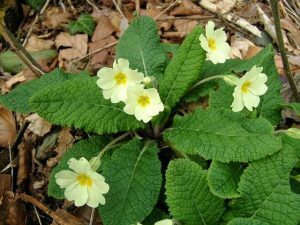 “A Simple Guide to the Wildflowers of Britain.” Country Life. 15 April 2017. 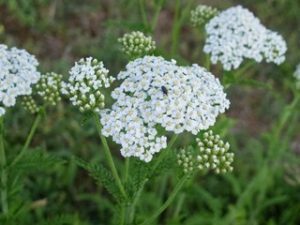 Accessed 10 October 2017. http://www.countrylife.co.uk/gardens/a-simple-guide-to-the-wildflowers-of-britain-71271. ← Anyone find any clues?